While BBOS has nowhere near the impressive OS adoption that BlackBerry 10 has shown, users are continuing to move towards a larger percentage running OS 7. August showed the newest version of BBOS exceeding 40% of the market for the first time, coming to 40.8% of users during the month. This data was collected by BlackBerry World for downloads of the free BlackBerry strategy game Pixelated. 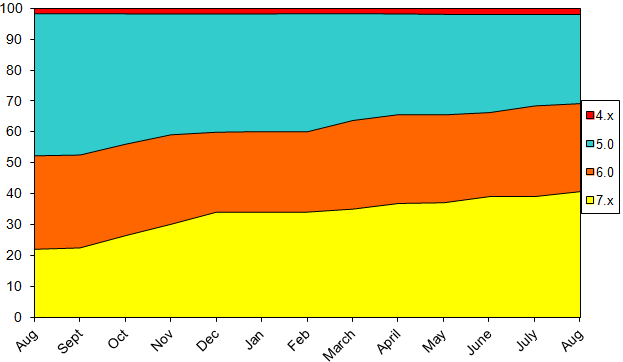 Data shown on the chart is from the beginning of August 2012 through the end of August 2013, and does not include BlackBerry 10 or PlayBook devices.